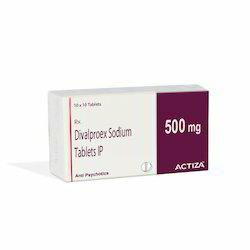 Offering you a complete choice of products which include divalproex sodium eq. valproic acid, oxcarbazepine, topiramate, gabapentin, carbamazepine and pregabalin. We are leading Exporter and Manufacturer of Divalproex Sodium eq. Valproic acid. Divalproex controls seizures or fits by suppressing the abnormal and excessive activity of the nerve cells in the brain. Divalproex Sodium eq. Valproic acid Tablets exporter in India. We are leading Exporter and Manufacturer of Oxcarbazepine. Oxcarbazepine controls seizures or fits by suppressing the abnormal and excessive activity of the nerve cells in the brain. Oxcarbazepine Tablets exporter in India. We are leading Exporter and Manufacturer of Topiramate. Topiramate controls seizures or fits by suppressing the abnormal and excessive activity of the nerve cells in the brain. Topiramate Tablets exporter in India. We are leading Exporter and Manufacturer of Gabapentin. Gabapentin decreases pain and seizures or fits by increasing the action of GABA, a chemical messenger in the nerve cells. Gabapentin Capsules exporter in India. We are leading Exporter and Manufacturer of Carbamazepine. Carbamazepine controls seizures or fits by suppressing the abnormal and excessive activity of the nerve cells in the brain. Carbamazepine Tablets exporter in India. We are leading Exporter and Manufacturer of Pregabalin. Pregabalin decreases pain and seizures or fits by increasing the action of GABA, a chemical messenger in the nerve cells. Pregabalin Capsules exporter in India. We are leading Exporter and Manufacturer of Paroxetine Controlled Release. 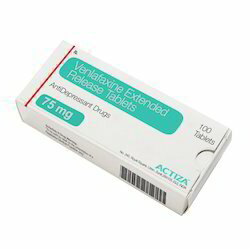 Paroxetine increases the levels of serotonin in the brain. Serotonin is a chemical messenger in the brain that helps in regulating the mood. Paroxetine Controlled Release Tablets exporter in India. We are leading exporter and manufacturer of Escitalopram. Escitalopram increases the levels of serotonin in the brain. Serotonin is a chemical messenger in the brain that helps in regulating the mood. Escitalopram Tablets exporter in India. We are leading exporter and manufacturer of Duloxetine 20,30,40,60 mg.
Duloxetine increases the levels of chemical messengers in the brain that helps in regulating the mood and treat depression. Duloxetine 20,30,40,60 mg Tablets exporter in India. We are leading exporter and manufacturer of Venlafaxine. Venlafaxine increases the levels of chemical messengers in the brain that helps in regulating the mood and treat depression. Venlafaxine Tablets exporter in India. We are leading exporter and manufacturer of Imipramine HCI . 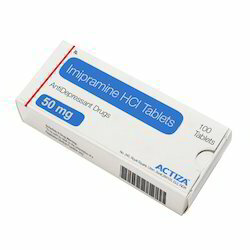 Imipramine HCI Tablets exporter in India. We are leading exporter and manufacturer of Fluoxetine HcI. Fluoxetine increases the levels of serotonin in the brain. Serotonin is a chemical messenger in the brain that helps in regulating the mood. Fluoxetine HcI Capsules exporter in India. We are leading exporter and manufacturer of Amitryptyline HCI. Amitryptyline 10mg tablet increases the levels of chemical messengers in the brain that help in regulating the mood and treat depression. Amitryptyline HCI Tablets exporter in India. Naltrexone Tablets exporter in India. We are leading Exporter and Manufacturer of Amisulprid. Amisulpride work by modulating the action of certain chemical messengers in the brain that affects thoughts. Amisulprid Tablets exporter in India. We are leading Exporter and Manufacturer of Clozapine. Clozapine works by modulating the action of certain chemical messengers in the brain that affects thoughts and mood. Clozapine Tablets exporter in India. We are leading Exporter and Manufacturer of Haloperidol Dispersible. Haloperidol works by blocking the action of dopamine, a chemical messenger in the brain that affects the thoughts and moods. Haloperidol Dispersible Tablets exporter in India. We are leading Exporter and Manufacturer of Flupenthixol. Flupenthixol works by blocking the action of dopamine, a chemical messenger in the brain that affects the thoughts and moods. Flupenthixol Tablets exporter in India. We are leading Exporter and Manufacturer of Donepezil HCI. Memory loss in Alzheimer’s disease is due to disturbance of message signals in the brain. The Donepezil works by increasing the levels of acetylcholine, a chemical messenger involved in the transmission of nerve signals. Donepezil HCI Tablets exporter in India. We are leading exporter and manufacturer of Disulfiram. Disulfiram belongs to a family of medicines called aldehyde dehydrogenase inhibitors. When alcohol is consumed, it is converted into a chemical called aldehyde by natural breakdown process, this chemical is further broken down by the chemical (enzyme) aldehyde dehydrogenase thereby allowing alcohol to be excreted. Disulfiram stops this enzyme aldehyde dehydrogenase causing an increase in the blood levels of aldehydes. As a result, the person on alcohol gets very unpleasant reactions (also known as aldehyde syndrome) such as flushing, burning sensation, throbbing headache, perspiration, uneasiness, tightness in chest, dizziness, vomiting, visual disturbances, mental confusion, postural fainting and circulatory collapse which last for nearly 1-4 hours (depending upon the quantity of alcohol intake). Sensitivity to alcohol is developed which lasts for a long period of time, as a result the person experiences unpleasant reactions upon consuming alcohol even days after stopping disulfiram. Disulfiram Tablets exporter in India. We are leading Exporter and Manufacturer of Olanzapine. Olanzapine works by modulating the action of certain chemical messengers in the brain that affects thoughts and mood. Sleepiness, Weight gain, Increased prolactin level in blood, Orthostatic hypotension (sudden lowering of blood pressure on standing) . Olanzapine Tablets exporter in India. Looking for CNS Medicines ?